Michael McFadyen's Scuba Diving - The Arch, Jervis Bay The coast of New South Wales is blessed with some of the most magnificient coastal scenery that will be experienced anywhere in the World. One of the most special places is Jervis Bay on the South Coast of the State. This huge bay is protected by two fantastic headlands and an island that tower up over the bay and ocean. The section of coastline to the north of the entrance of the bay is possibly the most spectacularly beautiful and rugged I have ever seen. The cliffs are pure vertical walls that rise a 100 metres or more straight out of the Pacific Ocean. In NSW there are a number of dive sites called "The Arch". There is one at Shellharbour, one at Batemans Bay, one at Swansea and there may well be more. 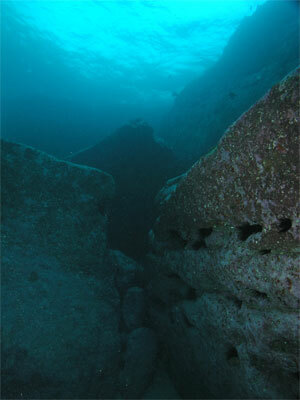 A short distance north of the northern headland of Jervis Bay (Point Perpendicular) there is yet another Arch. This one is probably the best of the three mentioned above. Less than 200 metres off the shore the waters of the Pacific Ocean have carved out an amazing feature that presents a great dive site, especially for the more experienced diver. The actual dive site is located just a hundred or so metres to the north of the first point that you see as you round Point Perpendicular. Go to 35° 05' 05"S 150° 49' 12"E (note that all my GPS Readings are using AUS66 - if you use any other datum, you will need to convert the reading - see my GPS Page for more details). The site is found by running into towards the huge gully ahead. Line up the front left side of the gully with the back right side (as you look at it). As you run in, the depth is over 40 metres. It will suddenly rise to 28 metres, then drops to 35 metres before rising to 25 metres and shallower. When the depth drops to 35 metres, your sounder will normally show bottoms at both 35 metres and either 28 or 25 metres. This is actually the gully behind The Arch. Using the depth sounder, drop anchor as soon as the bottom comes up to 25 metres or less. The depth will depend on how far you are anchored from The Arch. As indicated, if you are very accurate, on your depth sounder you will see a rise, then a drop again to 35 metres (into the area behind The Arch) and then a rise to 25 again. Further to the east the bottom is made up of small rocks with larger boulders scattered around. Again, the fixed life is still excellent. On some dives here I have also seen up to 60 Port Jackson sharks in this area. The depth can get to 40 metres or so if you move a bit further away from The Arch. A recommended route for a dive is to follow the outside of The Arch to the north and here you will see some very large boulders. This is very close to the northern end of the gully that you first encountered and leads back to the anchor area. Go back to the south or south-west and re-enter the gully. If you have time, go back under The Arch and explore the southern wall. Come up over the wall and return to the anchor. An alternative is to follow the wall to the south outside The Arch. This is an excellent dive, with a great vertical wall extending for at least 100 metres. There are also huge boulders off the wall, very interesting to explore, especially with a scooter. The remaining time (if any) can be spent in the shallow area. Depending on the depth you reach, the amount of time spent at the deeper parts, you will probably only get about 20 to 24 minutes bottom time at the most. Visibility is normally very good. Most dives I have done here have had about 25 to 30 metres visibility. 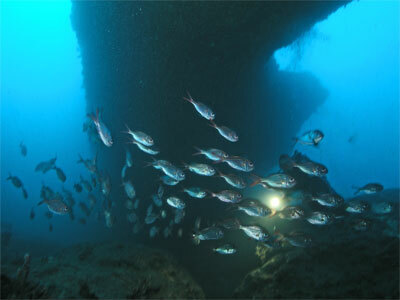 This is a great dive and one of the best, not only at Jervis Bay, but in New South Wales. A must do for the more experienced diver.